Navratri is a 9 day Hindu festival for Goddess Durga (Shakti). 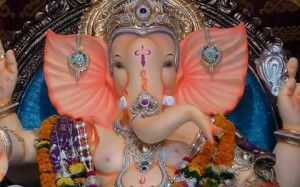 Navratri is one of the biggest festivals among Mumbai’s Gujarati community, which constitutes 19% of the population. There are two Navratri festival in a year. “Chaitra Navratri” (also called “Vasant Navratri” and “Ram Navratri”) is usually in March or April. The ninth day of Chaitra Navratri is “Ram Navami”. In Maharashtra, the first day of Chaitra Navratri is “Gudi Padwa”, which is the Maharashtrian New Year. The second Navratri is called “Sharad Navratri” and it is usually in September or October. The day after Sharad Navratri is Dusshera. In Mumbai it is Sharad Navratri that is celebrated with fervour and passion and this article is mainly about Sharad Navratri. Navratri Festival End Date in 2018: October 18, 2018 (Thursday). Dusshera (Dashami or Vijaydashmi) is on October 19, 2018 (Friday)..
Idols of Goddess Durga are immersed (Visarjan) on “Vijayadashami” (“Dusshera”), October 19, 2018 (Friday). Chaitra Navratri Festival End Date in 2019: April 14, 2019 (Sunday) (Ram Navami). Chaitra Navratri Festival End Date in 2020: April 2, 2020 (Thursday) (Ram Navami). Mumbai has a 10:00 pm deadline for Dandiya Raas and Garba. On the last 2 days of Navratri, Garba and Dandiya organizers are allowed to play music up to 12:00 midnight. As per Mumbai rules, 55 decibels is the maximum level of noise allowed in residential areas before 10:00 pm. After 10:00 pm, the noise level should not exceed 45 decibel. Pramod Mahajan Sports Complex, Chikuwadi, Borivali: Falguni Pathak and her band “Ta Thaiya” will perform at this venue during Mumbai Navratri 2018. Falguni Pathak is one of the most famous Dandiya and Garba musician in Mumbai. Kutchi Ground (Near Aura Hotel, Borivali West): Sisters Preeti and Pinki will be performing at Kutchi Ground in Borivali West during Mumbai Navratri 2018. Over the years Preety and Pinki have gained a large fan following. KoraKendra Ground (Haridas Nagar, Borivali West): Kora Kendra Ground is one of the most popular Dandiya and Garba Venue in Mumbai. It is estimated that around 200,000 people attend the Navrati Festival at the huge Kora Kendra Ground. The wooden dance floor is around 1,00,000 square feet. These Dandia celebrations are organized by Naidu Club. Sardar Vallabhbhai Patel Indoor Stadium, NSCI, Haji Ali: This is an air-conditioned indoor venue. Raghuleela Mall, Kandivali West: This is an air-conditioned venue where patrons can dance in comfort. Pushpanjali Gardens Ground (Near Don Bosco School, Borivali West): Pushpanjali Gardens Ground is a large venue where 30,000 people can enjoy Dandiya and Garba dance. Maitri Lawn, Near Mahavir Nagar, Borivali West: Hindi movie music director, Ram Shanker will perform with a group of Garba artist. Police Parade Ground (Ghatkopar East): This is a popular venue for Garba and Dandiya Raas in mumbai. Navratri Mahotsav Raas Garba at this venue is organized by Ghatkopar Gujrati Samaj. Goregaon Sports Club (Link Road, Malad West): The popular Dandia and Garba Raas at this venue is organized by Sankalp Dandiya Navratri Group. In addition to these venues, many housing societies in Mumbai organize Navratri celebrations in their buildings. These are some of the most famous Dandiya and Garba Singers and Musicians who perform in Mumbai during Navratri. Falguni Pathak and her Dandiya band “Tha Thaiyaa”. Devotees visit temples and fast for Navratri’s nine days. Nine forms of Goddess Durga are worshiped, one for each day. The nine forms of Goddess Durga are Shailputri, Brahmacharini, Chandraghanta, Kushmanda, Skandamata, Katyayani, Kalratri, Mahagauri, Siddhidatri. 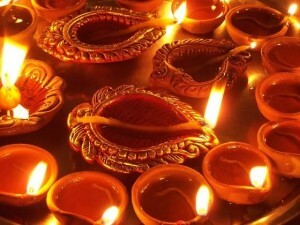 Devotees light a lamp in a “Garbo” or “Ghatasthapana” (decorated earthen pot) for 9 days. The “Garbo” has holes in it and it represents the human body. In the evening, all family members celebrate the victory of Goddess Ambaji/Durga over Mahisasura by dancing “Raas Garba” and “Dandiya Raas”. “Dusshera” is celebrated on the day after the 9th day of Navratri. Durga Idol Visarjan (Immersion) is done on the 10th day. 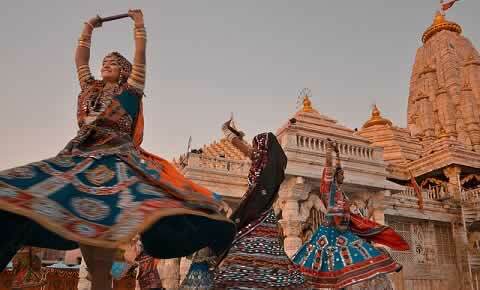 In “Garba” the dancer moves his/her hands and feet to four beats; whereas in “Dandiya Rass”, dancers dance with sticks. 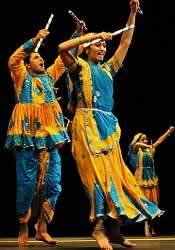 The easiest and most popular Raas Garba dances are the “Be Taali” (2 claps) and “Traan Taali” (3 claps). Please see the below video for simple instructions on these Garba steps. Other popular types of Garba Rass Dance are “Butterfly” (clapping and moving in a circle like a butterfly), “Trikonyu” (make a triangle movement), “Hudo” (raise hands and clap with a partner after 4 beats), “Popatiyu” (clap after 2 steps forward and 4 steps back), “Dodhiyu” (forward and backward movement to 8, 10, 12 beats), etc. Dandia Raas is played with 2 decorated sticks which are touched with a partner’s sticks in a choreographed pattern. Usually, dancers form an inner and outer circle; one moves in a clock-wise and the other in a counter clock-wise direction. The inner and outer circle dancers partner each other in playing Dandiya Rass. Different types of Dandiya Raas dance are “Five Steps” technique, “Seven Steps”, etc. “5 Step Dandiya Raas” is the most popular Dandia and the below video has easy instructions on how to play 5 Step Dandiya Raas. 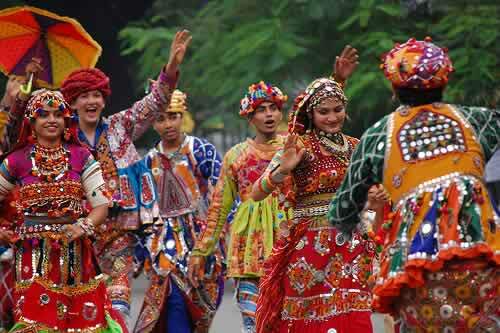 The original folk dances of Garba Rass and Dandia Raas started as a depiction of the 9 day battle between Goddess Durga (“Ambaji”) and Mahisasura. With this in mind, the “Dandiya” (sticks) and the “Garba” style of dance make a lot of sense. Mahisasura was an “Asura” (Demon) who defeated Indra, the Hindu God of the “Devas” (Gods). Mahisasur threw out the Gods from Heaven. Since Mahisasura could not be defeated by any man, the Gods created Durga an avatar of Godess Parvati or Shakti. Maa Durga defeated the “Asuras” (Demons) and fought a long 9 day battle with Mahisasura, finally killing him on the tenth day. Young girls and ladies wear colourful ethnic Gujarati style “Chaniya Choli”, “Ghagra Choli”, “Lehenga Choli” and sarees. Metal jewellery is often worn and so are white bangles on the forearms and biceps. On top, boys and men wear the traditional Gujarati Kurta, called “Zabbho” or “Kedia” (“Kediya”) and on the bottom a Pajama or Dhoti called “Dhotiyu” or “Lehanghas”. Men also wear a “Pagdee” (Turban). Just before Navratri, many of Mumbai’s Dance Schools/Academies/Trainers provide Dandiya and Garba Ras dance classes. This is a list of some of the Garba Raas and Dandiya dance training classes in Mumbai.